Born in Minnesota as Adelard Cunin, he moved to Chicago when he was a teenager and adopted the name George Moran so that he could join an Irish gang. His first arrest came on 17 September 1910 and they came thick and fast after that but he stayed out of jail until 31 May 1918 when he was sent to Joliet State Prison for armed robbery. He spent five years inside, gaining parole on 1 February 1923 and returned to his gang to find that Dion O’Banion had taken the reins. Moran worked with O’Banion, “Hymie” Weiss and Vincent “The Schemer” Drucci to nut the North Side. Their men often invaded the territory on the South Side, ran by Al Capone and Johnny Torrio. Following O’Banion’s murder, Moran became second-in-command to “Hymie” Weiss. They plotted their revenge and on 24 January 1925 Moran, Drucci, Gusenberg and Weiss tried to kill Torrio as he and his wife returned home to South Clyde Avenue from a shopping trip. On 13 June 1925 an attempt was made on the lives of Moran and Drucci. On 20 September 1926 Moran, Weiss and several cars of hoodlums drove slowly past Al Capone’s Hawthorne Inn headquarters and sprayed the building with thousands of bullets. Capone lay under a table on the first floor. Remarkably, no one was killed in the attack. 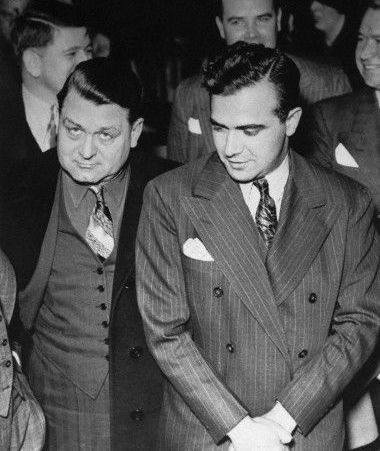 Capone gave orders to eliminate the North Side gang. On 11 October 1926 Weiss was machine gunned to death outside Holy Name Cathedral and Moran took over the gang. A policeman killed Drucci on 4 April 1927. For almost two years peace reigned between Moran and Capone and then Capone had several members of Moran’s gang killed in the St Valentine’s Day Massacre (search the article). Moran’s power declined after that but he still ran the 42nd and 43rd Street wards in the 1930s. At lam on 15 February 1936 Moran and his men executed “Machine Gun Jack” McGurn who was believed (wrongly) to be behind the 14 February carnage. By 1940 Moran’s power was gone and he resorted to burglary to pay his bills. He said, “I hope when my time comes that I die decently in bed. I don’t want to be murdered beside the garbage cans in some Chicago alley.” In fact, he died at Fort Leavenworth Prison on 25 February 1957 while serving a sentence for robbery.